Patients can find themselves in vulnerable situations, perhaps feeling helpless, overwhelmed or mistreated when it comes to making health care decisions. When these individuals and their family members don’t know how to deal with a doctor’s recommendation, a hospital bill or an insurance mishap, they turn to patient advocates for help. According to MD magazine, there are two main types of advocates in the health care system: general patient advocates and billing patient advocates. A patient advocate stands by to ask doctors and caregivers questions that the patient may not think of or feel comfortable enough to ask. Advocates take down the necessary information to discuss with the patient privately so they can make the best possible care decision. An advocate should be well-versed in health care policy and general information, have impressive verbal communication skills and be trustworthy. Similarly, a billing advocate defends the patient in a financial context. The billing advocate ensures proper insurance claims processing and provider billing. He or she will work with insurance companies and providers to make sure patients are being billed fairly for the care they receive, and look for opportunities to maximize patients’ policy benefits. A billing advocate should also be trustworthy, knowledgeable about health insurance and billing, and possess excellent communication skills. 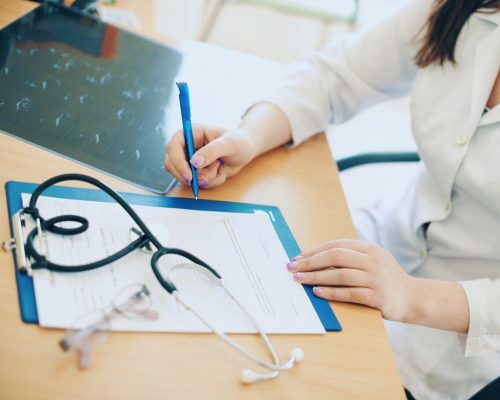 Read on to dive deeper into the qualities needed to become a patient advocate, and how Hofstra Law’s health law and policy programs can get you there. Communication: You must be the liaison between the patient or those responsible for his or her care and finances. That means understanding how to be an effective listener, as well as an assertive mediator. Organization: Between health providers’ care instructions, insurance carriers’ policies and your patients’ preferences, you have a lot of information to juggle. This requires organization of your notes, ideas, arguments and time. A good patient advocate is thorough in organizing notes, appointments and case management. Patience: Your patients may express their concerns by venting or complaining. Patience is necessary when dealing with patients who are stressed, worried or overwhelmed by medical concerns and finances. Problem-solving: Patients are relying on you to guide them through their medical, financial and legal issues. You must have research and negotiation skills to navigate their disputes and develop a resolution that works for each specific case. Trustworthiness: Patients trust advocates to be their voice during an unsettling and uncomfortable situation. It is your responsibility to show your patients that they can confide in you during these trying times, and that you’ll develop the right resolution in confidence. How can Hofstra Law prepare you for a career in advocacy? Introduction to the American Legal System: In this course, you’ll learn about the ins and outs of the American legal system, delving into the creation, interpretation and applications of laws. This foundation in American law serves as a valuable backdrop when you make advocacy decisions on behalf of your patient. Bioethics and Law: This class revolves around the contemporary problems of law, medicine and ethics. You’ll discover the responsibilities that physicians have when it comes to medical treatment, death, abortion, genetics, transplants and more. Understanding the ethical dilemmas and nuances in health care from a physician’s point of view can improve your communication with stakeholders and help you make more informed decisions. Representing Health Care Providers: In this class, you’ll learn how lawyers can represent single institutions to a larger health care system, and even the professionals employed by providers. You’ll better understand the federal and state regulatory issues that providers face on a daily basis. Learning about this side allows you to consider the perspective of the provider. Exploring the situation can make you a well-informed advocate. Capstone: During the final semester of your health law and policy program, you’ll be expected to complete the capstone course. Here, you’ll demonstrate all of the knowledge and skills gained throughout the program, identifying problems encountered in health care that coincide with regulation, bioethics, insurance and health care transactions and more. The final project is a paper, where you’ll explain two or more common issues faced in the health care system, providing solutions for each. Should you choose to center your project around advocacy, this is an opportunity to develop resolutions for patients, apply your learning and prove your ability to be a knowledgeable and trustworthy patient advocate. If you’re ready to enhance your career and become a patient advocate, Hofstra Law can provide the education, skills and tools you need to succeed.